Getting any plant to survive as a house plant usually involves doing your best to duplicate the plants natural growing conditions and environment. Imitating Mother Nature to the satisfaction of Carnivorous plants is more of a challenge than most typical house plants because of the extreme conditions that these plants originated and evolved in. Most carnivorous insectivores are native to boggy areas where the peaty soil is extremely acidic and constantly saturated with water, or in soil which is essentially void of the essential nutrients needed by most plants. Because the soil they live in does not provide them with their required nitrogen and other nutrients, carnivorous plants eat insects. These plants generally produce some type of scent or nectar which attracts their insect prey. or will become stuck to the sticky sap which coats the inner surface of the plant. Once the insect has become ensnared, the plant secretes an acidic enzyme which basically 'disolves' the insect, so that the nutrients may be absorbed and used by the plant. Because they require very high humidity of 70%-90%, the best way to duplicate the native environment that your carnivorous plants came from is by creating a partially open terrarium. The terrarium environment ensures that the high humidity most carnivorous plants require is maintained, as well as allowing you to move it about and place it where the light is sufficiently bright. Your terrarium can be put together using something as small as a gallon jar for a single plant, or as large as the biggest aquarium you can afford if you'd like to create an elaborate carnivore community. 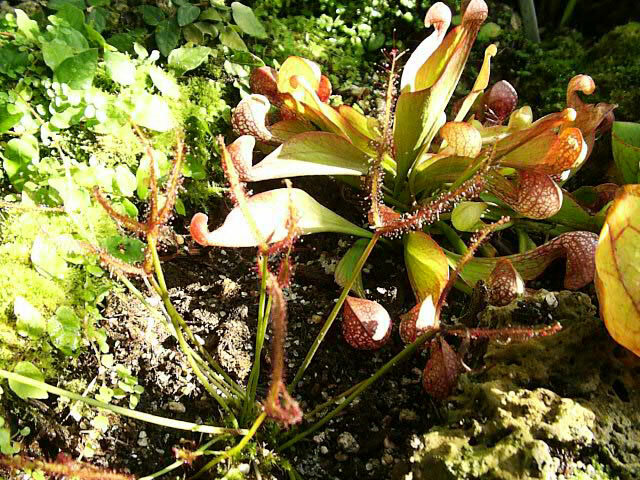 To provide the highly acidic planting medium required by carnivorous plants, I recommend using a base of sphagnum peat moss to which you have added some medium grade orchid bark and course builders sand to prevent the peat from caking. Water the peat moss mix thoroughly using distilled or preferably rainwater and allow sufficient time for all particles of the peat to become saturated. Then cover the base with fresh sphagnum moss to make the garden look more natural, and add any other garden ornaments that you might feel are appropriate (rocks, sticks, a saucer for a pond...) to the setting. You can then add your carnivorous plants to your garden, following any special instructions which may apply to a particular plant. Carnivorous plants have very sensitive roots and should never be fertilized. Carnivorous plants, like most plants need fresh air circulation, so DO NOT completely seal your terrarium. The soil in which your carnivorous plants live should always be kept moist, but never soggy. 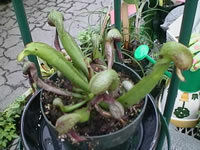 Carnivorous plants should be watered with rainwater or distilled water to prevent mineral build-up in the soil, which can damage the sensitive root structure. Most carnivorous plants require very bright light (almost full sun), situate your terrarium in one of your brightest windows. If the window gets hot sun all day, you risk 'cooking' your garden so place the garden a foot or two back from the window. If you light your terrarium artificially, use fluorescent rather than incandescent 'grow lights' to avoid excess heat. 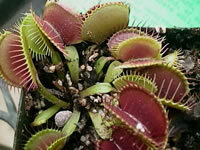 Carnivorous plants are not 'Meat Eaters', they are insectivores! so research the needs of any new insectivores before you add them to your collection.